Cognitive flexibility[note 1] has been described as the mental ability to switch between thinking about two different concepts, and to think about multiple concepts simultaneously. Cognitive flexibility is usually described as one of the executive functions. Two subcategories of cognitive flexibility are task switching and cognitive shifting, depending on whether the change happens unconsciously or consciously, respectively. Cognitive flexibility varies during the lifespan of an individual. In addition, certain conditions such as obsessive–compulsive disorder are associated with reduced cognitive flexibility. Since cognitive flexibility is a vital component of learning, deficits in this area might have other implications. Methods of measuring cognitive flexibility include the A-not-B task, Dimensional Change Card Sorting Task, Multiple Classification Card Sorting Task, Wisconsin Card Sorting Task, and the Stroop Test. Functional Magnetic Resonance Imaging (fMRI) research has shown that specific brain regions are activated when a person engages in cognitive flexibility tasks. These regions include the prefrontal cortex (PFC), basal ganglia, anterior cingulate cortex (ACC), and posterior parietal cortex (PPC). Studies conducted with people of various ages and with particular deficits have further informed how cognitive flexibility develops and changes within the brain. Cognitive flexibility can be seen from a variety of viewpoints. A synthesized research definition of cognitive flexibility is a switch in thinking, whether that is specifically based on a switch in rules or broadly based on a need to switch one's previous beliefs or thoughts to new situations. Moreover, it refers to simultaneously considering multiple aspects of thought at once, whether they be two aspects of a specific object, or many aspects of a complex situation. Other terms for and components of cognitive flexibility include mental flexibility, mental set shifting, cognitive shifting, task switching/shifting, and attention switching/shifting. Cognitive flexibility varies during the lifespan of an individual. Researchers have more specifically described cognitive flexibility as the capacity to shift or switch one's thinking and attention between different tasks or operations typically in response to a change in rules or demands. For example, when sorting cards based on specific rules, children are considered cognitively flexible if they are able to successfully switch from sorting cards based on the color of the object to sorting based on the type of object on the card. Cognitive flexibility has been more broadly described as the ability to adjust one's thinking from old situations to new situations as well as the ability to overcome responses or thinking that have become habitual and adapt to new situations. As such, if one is able to overcome previously held beliefs or habits (when it is required for new situations) then they would be considered cognitively flexible. Lastly, the ability to simultaneously consider two aspects of an object, idea, or situation at one point in time refers to cognitive flexibility. According to this definition, when sorting cards based on specific rules, children are considered cognitively flexible if they can sort cards based on the color of the objects and type of objects on the card simultaneously. Similarly, cognitive flexibility has been defined as having the understanding and awareness of all possible options and alternatives simultaneously within any given situation. Regardless of the specificity of the definition, researchers have generally agreed that cognitive flexibility is a component of executive functioning, higher-order cognition involving the ability to control one's thinking. Executive functioning includes other aspects of cognition, including inhibition, memory, emotional stability, planning, and organization. Cognitive flexibility is highly related with a number of these abilities, including inhibition, planning and working memory. Thus, when an individual is better able to suppress aspects of a stimulus to focus on more important aspects (i.e. inhibit color of object to focus on kind of object), they are also more cognitively flexible. In this sense, they are better at planning, organizing, and at employing particular memory strategies. Researchers have argued that cognitive flexibility is also a component of multiple classification, as originally described by psychologist Jean Piaget. In multiple classification tasks, participants (primarily children, who have already developed or are in the process of developing this skill) must classify objects in several different ways at once - thereby thinking flexibly about them. Similarly, in order to be cognitively flexible they must overcome centration, which is the tendency for young children to solely focus on one aspect of an object or situation. For example, when children are young they may be solely able to focus on one aspect of an object (i.e. color of object), and be unable to focus on both aspects (i.e. both color and kind of object). Thus, research suggests if an individual is centrated in their thinking, then they will be more cognitively inflexible. Research has suggested that cognitive flexibility is related to other cognitive abilities, such as fluid intelligence, reading fluency, and reading comprehension. Fluid intelligence, described as the ability to solve problems in new situations, enables fluid reasoning ability. When one is able to reason fluidly, they are in turn more likely to be cognitively flexible. Furthermore, those who are able to be cognitively flexible have been shown to have the ability to switch between and/or simultaneously think about sounds and meanings, which increases their reading fluency and comprehension. Cognitive flexibility has also been shown to be related to one's ability to cope in particular situations. For example, when individuals are better able to shift their thinking from situation to situation they will focus less on stressors within these situations. In general, researchers in the field focus on development of cognitive flexibility between the ages of three and five. However, cognitive flexibility has been shown to be a broad concept that can be studied with all different ages and situations. Thus, with tasks ranging from simple to more complex, research suggests that there is a developmental continuum that spans from infancy to adulthood. A variety of assessments are appropriate for distinguishing between different levels of cognitive flexibility at different ages. Below are the common tests used to assess cognitive flexibility in the order of the developmentally appropriate age. In the A-not-B task, children are shown an object hidden at Location A within their reach, and are then prompted to search for the object at Location A, where they find it. This activity is repeated several times, with the hidden object at Location A. Then, in the critical trial, the object is hidden in Location B, a second location within easy reach of child. Typically, children younger than one year old search for the object under Location A, where the object was previously hidden. However, after their first birthday, children are capable of mentally switching to locate the object in Location B, demonstrating flexibility. Researchers have agreed that the A-not-B task is a simple task that effectively measures cognitive flexibility during infancy. In the Dimensional Change Card Sorting Task (DCCS), children are initially asked to sort cards by a single dimension (such as color), and are subsequently required to alter their strategy to sort cards based on a second dimension (such as shape). Typically, three-year-old children are able to sort cards based on a single dimension, but are unable to switch to sort the cards based on a second dimension. However, five-year-old children are able to sort cards based on one dimension and can then switch to sorting cards on a second dimension. In the Multiple Classification Card Sorting Task, children are shown cards and asked to sort them based on two different dimensions (e.g. by color, such as yellow and blue, and object type, such as animals and food) simultaneously into four piles within a matrix (e.g. yellow animals, yellow foods, blue animals and blue foods). 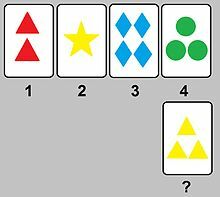 This task appears to be more difficult as research has shown that seven-year-old children were incapable of sorting cards based on the two dimensions simultaneously. These children focused on the two dimensions separately, whereas at the age of eleven, children were capable of sorting cards based on these two dimensions simultaneously. This demonstrates an increase in cognitive flexibility between the ages of seven and eleven. The Wisconsin Card Sorting Test (WCST) is used to determine an individual's competence in abstract reasoning, and the ability to change problem-solving strategies when needed. In this test, a number of cards are presented to the participants. The figures on the cards differ with respect to color, quantity, and shape. The participants are then given a pile of additional cards and are asked to match each one to one of the previous cards. Typically, children between ages nine and eleven demonstrate the cognitive flexibility needed for this test. The Stroop Test is also known as the Color-word Naming Test. In this measure, there are three types of cards in the deck. The "color card" displays patches of different colors, which participants are asked to identify as quickly as possible. The "word card," displays the names of colors printed in black and white ink, which participants are again asked name as quickly as possible. The final card type is the "color-word card", which displays the names of the colors printed in an ink of a conflicting color (e.g. the word RED would be printed in yellow), and requires participants to name the ink colors while ignoring the conflicting color names. The basic score on each card is the total time (in seconds) that the participant takes to respond verbally. Typically, naming the color of the word takes longer and results in more errors when the color of the ink does not match the name of the color. In this situation, adults tend to take longer to respond than children because adults are more sensitive to the actual color of the word and thus are more likely to be influenced by it when naming the conflicting color word printed. The mechanisms underlying cognitive flexibility have been explored extensively using various methods. Human studies using functional magnetic resonance imaging (fMRI) have revealed a variety of distinct regions of the brain that work in concert from which flexibility could be predicted reliably, including the prefrontal cortex (PFC), basal ganglia, anterior cingulate cortex (ACC), and posterior parietal cortex (PPC). The regions active during engagement of cognitive flexibility depend on the task and various factors involved in flexibility that are used to assess the behavior, as flexible thinking requires aspects of inhibition, attention, working memory, response selection, and goal maintenance. Several studies using task switching paradigms have demonstrated the complexities of the network involved in cognitive flexibility. Activation of the dorsolateral PFC has been shown during resolution of interference of irrelevant task sets. Another study further extended these results by demonstrating that the level of abstractness of the switch type influenced recruitment of differing regions in the PFC depending on whether the participant was asked to make a cognitive set switch, a response switch, or a stimulus or perceptual switch. A set switch would require switching between task rules, as with the WCST, and is considered to be the most abstract. A response switch would require different response mapping, such as circle right button and square left button and vice versa. Lastly, a stimulus or perceptual set switch would require a simple switch between a circle and a square. Activation is mediated by the level of abstractness of the set switch in an anterior to posterior fashion within the PFC, with the most anterior activations elicited by set switches and the most posterior activations resulting from stimulus or perceptual switches. The basal ganglia is active during response selection and the PPC, along with the inferior frontal junction are active during representation and updating of task sets called domain general switching. Children can be strikingly inflexible when assessed using traditional tests of cognitive flexibility, but this does not come as a surprise considering the many cognitive processes involved in the mental flexibility, and the various developmental trajectories of such abilities. With age, children generally show increases in cognitive flexibility which is likely a product of the protracted development of the frontoparietal network evident in adults, with maturing synaptic connections, increased myelination and regional gray matter volume occurring from birth to mid-twenties. Diminished cognitive flexibility has been noted in a variety of neuropsychiatric disorders such as anorexia nervosa, obsessive–compulsive disorder, schizophrenia, autism, and in a subset of people with ADHD. Each of these disorders exhibit varying aspects of cognitive inflexibility. For example, those with obsessive–compulsive disorder experience difficulty shifting their attentional focus as well as inhibiting motor responses. Children with autism show a slightly different profile with deficits in adjusting to changing task contingencies, while often maintaining the ability to respond in the face of competing responses. Potential treatments may lie in neurochemical modulation. Juveniles with Anorexia nervosa have marked decreases in set-shifting abilities, possibly associated with incomplete maturation of prefrontal cortices associated with malnutrition. One can also consider people with addictions to be limited in cognitive flexibility, in that they are unable to flexibly respond to stimuli previously associated with the drug. The elderly often experience deficits in cognitive flexibility. The aging brain undergoes physical and functional changes including a decline in processing speed, central sensory functioning, white matter integrity, and brain volume. Regions associated with cognitive flexibility such as the PFC and PC atrophy, or shrink, with age, but also show greater task-related activation in older individuals when compared to younger individuals. This increase in blood flow is potentially related to the evidence that atrophy heightens blood flow and metabolism, which is measured as the BOLD response, or blood-oxygen-level dependence, with fMRI. Studies suggest that aerobic exercise and training can have plasticity inducing effects that could potentially serve as an intervention in old age that combat the decline in executive function. Cognitive flexibility and other executive function skills are crucial to success both in classroom settings and life. A study examining the impact of cognitive intervention for at-risk children in preschool classrooms found that children who received such intervention for one to two years significantly outperformed their peers. Compared to same-age children who were randomly assigned to the control condition (a literacy unit developed by the school district), preschoolers who received intervention achieved accuracy scores of 85% on tests of inhibitory control (self-discipline), cognitive flexibility, and working memory. Their peers in the control (no intervention) condition, on the other hand, demonstrated only 65% accuracy. Educators involved in this study ultimately opted to implement the cognitive skills training techniques instead of the district-developed curriculum. Further indicative of the role cognitive flexibility plays in education is the argument that how students are taught greatly impacts the nature and formation of their cognitive structures, which in turn affect students' ability to store and readily access information. A crucial aim of education is to help students learn as well as appropriately apply and adapt what they have learned to novel situations. This is reflected in the integration of cognitive flexibility into educational policy regarding academic guidelines and expectations. For example, as outlined in the Common Core State Standards Initiative, a standards-based education reform developed to increase high school graduation rates, educators are expected to present within the classroom "high level cognitive demands by asking students to demonstrate deep conceptual understanding through the application of content knowledge and skills to new situations." This guideline is the essence of cognitive flexibility, and a teaching style focused on promoting it has been seen to foster understanding especially in disciplines where information is complex and nonlinear. A counterexample is evident in cases where such material is presented in an oversimplified manner and learners fail to transfer their knowledge to a new domain. An alternative educational approach informed by cognitive flexibility is hypertext, which is frequently computer-supported instruction. Computers allow for complex data to be presented in a multidimensional and coherent format, allowing users to access that data as needed. The most widely used example of hypertext is the Internet, which dynamically presents information in terms of interconnection (e.g. hyperlinks). Hypertext documents, therefore, include nodes – bits of information – and links, the pathways between these nodes. Applications for teacher education have involved teacher-training sessions based on video instruction, whereby novice teachers viewed footage of master teachers conducting a literacy workshop. In this example, the novice teachers received a laserdisc of the course content, a hypertext document that allowed the learners to access content in a self-directed manner. These cognitive flexibility hypertexts (CFH) provide a "three-dimensional" and "open-ended" representation of material for learners, enabling them to incorporate new information and form connections with preexisting knowledge. While further research is needed to determine the efficacy of CFH as an instructional tool, classrooms where cognitive flexibility theory is applied in this manner are hypothesized to result in students more capable of transferring knowledge across domains. Researchers in the field advocate a teaching style that incorporates group problem-solving activities and demands higher-level thought. According to this process, a teacher initially poses a single question in a number of ways. Next, students discuss the problem with the teacher and amongst themselves, asking questions. In forming these questions, students are actively brainstorming and recalling prior knowledge. At this point, the teacher provides specific conditions of the issue discussed, and students must adapt their prior knowledge, along with that of their peers, to generate a solution. A vastly different application can be seen in the study of cognitive flexibility and video games. Examining the trait under the guise of "mental flexibility", Dutch researchers observed that players of first-person shooter games (e.g. Call of Duty, Battlefield) exhibited greater "mental flexibility" on a series of measures than did non-gamers. The researchers posit that, while video game play may be controversial due to frequently graphic content, harnessing the effect of such games could lead to similar gains in various populations (e.g. the elderly, who face cognitive decline) and is therefore socially relevant. Several online programs marketed to those seeking to increase cognitive ability have been created to enhance "brain fitness", including cognitive flexibility. ^ Other terms for and components of cognitive flexibility include mental flexibility, mental set shifting, cognitive shifting, task switching/shifting, and attention switching/shifting. ^ a b Scott, William A. (December 1962). "Cognitive complexity and cognitive flexibility". Sociometry. 25 (4): 405–414. doi:10.2307/2785779. JSTOR 2785779. ^ Cooper-Kahn, Joyce; Dietzel, Laurie C. (2008). "What is executive functioning?". ldonline.org. National Center for Learning Disabilities and WETA-TV. Archived from the original on September 20, 2014. ^ a b c Chelune, Gordon J.; Baer, Ruth A. (1986). "Developmental norms for the Wisconsin Card Sorting Test". Journal of Clinical and Experimental Neuropsychology. 8 (3): 219–228. doi:10.1080/01688638608401314. PMID 3722348. ^ a b Boger-Mehall, Stephanie R. (1996). "Cognitive flexibility theory: implications for teaching and teacher education". learntechlib.org. Association for the Advancement of Computing in Education. pp. 991–993. Archived from the original on March 9, 2018. Retrieved November 18, 2012. ^ a b Leber, A B; Turk-Browne N B; Chun M M (September 9, 2008). "Neural predictors of moment-to-moment fluctuations in cognitive flexibility". Proceedings of the National Academy of Sciences. 105 (36): 13592–7. doi:10.1073/pnas.0805423105. PMC 2527350. PMID 18757744. ^ a b c Miyake, A; Friedman, N P; Emerson, M J.; Witzki, A H; Howerter, A; Wagner, T (2000). "The unity and diversity of executive functions and their contributions to complex "frontal lobe" tasks: A latent variable analysis". Cognitive Psychology. 41 (1): 49–100. CiteSeerX 10.1.1.485.1953. doi:10.1006/cogp.1999.0734. PMID 10945922. ^ Moore, Adam; Malinowski, Peter (2009). "Mediation, mindfulness, and cognitive flexibility". Consciousness and Cognition. 18 (1): 176–186. doi:10.1016/j.concog.2008.12.008. PMID 19181542. ^ Deak, G O (2003). The development of cognitive flexibility and language abilities. Advances in Child Development and Behavior. 31. pp. 271–327. doi:10.1016/s0065-2407(03)31007-9. ISBN 9780120097319. PMID 14528664. ^ a b Bigler, R S; Liben, L S (1992). "Cognitive mechanisms in children's gender stereotyping: Theoretical and educational implications of a cognitive-based intervention". Child Development. 63 (6): 1351–1363. doi:10.1111/j.1467-8624.1992.tb01700.x. PMID 1446556. ^ Martin, M M; Rubin, R B (1995). "A new measure of cognitive flexibility". Psychological Reports. 76 (2): 623–626. doi:10.2466/pr0.1995.76.2.623. ^ "Executive Function Fact Sheet". National Center for Learning Disabilities and WETA-TV. 2005. Archived from the original on January 2, 2013. Retrieved December 31, 2012. ^ a b c Cartwright, K B (2002). "Cognitive development and reading: The relation of reading-specific multiple classification skill to reading comprehension in elementary school children". Journal of Educational Psychology. 94: 56–63. doi:10.1037/0022-0663.94.1.56. ^ Piaget, J (1972). "The mental development of the child". In Weiner, I B; Elkind, D (ed.). Readings in Child Development. John Wiley & Sons, Inc. pp. 271–279. ISBN 978-0-471-92573-6. ^ Colzanto, L S; van Wouwe, N C; Lavender, T J; & Hommel, B (2006). "Intelligence and cognitive flexibility: Fluid intelligence correlates with feature "unbinding" across perception and action". Psychonomic Bulletin & Review. 13 (6): 1043–1048. doi:10.3758/BF03213923. ^ Han, H D; Park, H W; Kee, B S; Na, C; Na, D E; Zaichkowsky, L (1998). "Performance enhancement with low stress and anxiety modulated by cognitive flexibility". Psychiatry Investigation. 7 (3): 221–226. doi:10.4306/pi.2011.8.3.221. PMC 3182387. PMID 21994509. ^ a b Zelazo, P D; Frye, D (1998). "Cognitive complexity and control: II. The development of executive function in childhood". Current Directions in Psychological Science. 7 (4): 121–126. doi:10.1111/1467-8721.ep10774761. ^ a b c Kirkham, N Z; Cruess, L; Diamond, A (2003). "Helping children apply their knowledge to their behavior on a dimension-switching task". Developmental Science. 6 (5): 449–476. doi:10.1111/1467-7687.00300. ^ Fisher, A (2011). "Automatic shifts of attention in the Dimensional Change Card Sort Task: Subtle changes in task materials lead to flexible switching" (PDF). Journal of Experimental Child Psychology. 111-119. 108: 211–219. doi:10.1016/j.jecp.2010.07.001. ^ Zelazo, P D; Frye, D; Rapus, T (1996). "An age-related dissociation between knowing rules and using them". Cognitive Development. 11 (1): 37–63. doi:10.1016/S0885-2014(96)90027-1. ^ Biederam J, Faraone S, Monutaeux M, et al. (2000). "Neuropsychological functioning in nonreferred siblings of children with attention deficit/hyperactivity disorder". Journal of Abnormal Psychology. 109 (2): 252–65. doi:10.1037/0021-843X.109.2.252. ^ Jensen, A R (1965). "Scoring the Stroop test". Acta Psychologica. 24 (5): 398–408. doi:10.1016/0001-6918(65)90024-7. PMID 5841721. ^ Hyafil, A; Summerfield C; Koechlin E (2009). "Two mechanisms for task switching in the prefrontal cortex". Journal of Neuroscience. 29 (16): 5135–5142. doi:10.1523/JNEUROSCI.2828-08.2009. PMID 19386909. ^ Kim, C; Johnson N F; Cilles S E; Gold B T (March 30, 2011). "Common and distinct mechanisms of cognitive flexibility in prefrontal cortex". Journal of Neuroscience. 31 (13): 4771–9. doi:10.1016/j.brainres.2012.06.013. PMC 3411858. PMID 22750124. ^ Yehene, E; Meiran N; Soroker N (June 2008). "Basal ganglia play a unique role in task switching within the frontal-subcortical circuits: evidence from patients with focal lesions". Journal of Cognitive Neuroscience. 20 (6): 1079–93. doi:10.1162/jocn.2008.20077. PMID 18211234. ^ Morton, JB; Bosma R; Ansari D (2009). "Age-related changes in brain activation associated with dimensional shifts of attention: An fMRI study". NeuroImage. 46 (1): 249–256. doi:10.1016/j.neuroimage.2009.01.037. PMID 19457388. ^ Steinglass, J E; Walsh B T; Stern Y (May 2006). "Set shifting deficit in anorexia nervosa". Journal of the International Neuropsychological Society. 12 (3): 431–5. doi:10.1017/s1355617706060528. PMID 16903136. ^ Etchepareborda, M C; Mulas F (February 2004). "[Cognitive flexibility, an additional symptom of attention deficit hyperactivity disorder. Is it a therapeutically predictive element?]". Revista de Neurología (in Spanish). 38 (Suppl 1): S97–102. PMID 15011162. ^ Chamberlain, S R; Blackwell A D; Fineberg N A; Robbins T W; Sahakian B J (May 2005). "The neuropsychology of obsessive compulsive disorder: the importance of failures in cognitive and behavioural inhibition as candidate endophenotypic markers". Neuroscience & Biobehavioral Reviews. 29 (3): 399–419. doi:10.1016/j.neubiorev.2004.11.006. PMID 15820546. ^ Kriete, T; Noelle D C (2005). "Impaired cognitive flexibility and intact cognitive control in autism: A computational cognitive neuroscience approach". Proceedings of the 27th annual conference of the cognitive science society. pp. 1190–1195. ^ Bühren, K; Mainz V; Herpertz-Dahlmann B; Schäfer K; Kahraman-Lanzerath B; Lente C; Konrad K (2012). "Cognitive flexibility in juvenile anorexia nervosa patients before and after weight recovery". Journal of Neural Transmission. 119 (9): 1047–1057. doi:10.1007/s00702-012-0821-z. PMID 22644538. ^ Stalnaker, T A; Takahashi Y; Roesch MR; Schoenbaum G (2009). "Neural substrates of cognitive inflexibility after chronic cocaine exposure". Neuropharmacology. 56 (Suppl 1): 63–72. doi:10.1016/j.neuropharm.2008.07.019. PMC 2647515. PMID 18692512. ^ Greenwood, P M (November 2007). "Functional plasticity in cognitive aging: review and hypothesis". Neuropsychology. 21 (6): 657–73. CiteSeerX 10.1.1.461.9003. doi:10.1037/0894-4105.21.6.657. PMID 17983277. ^ Masley, S; Roetzheim R; Gualtieri T (2009). "Aerobic exercise enhances cognitive flexibility". Journal of Clinical Psychology in Medical Settings. 16 (2): 186–193. doi:10.1007/s10880-009-9159-6. PMID 19330430. ^ Diamond, A.; Barnett, W S; Thomas, J; Munro, S (2007). "Preschool Program Improves Cognitive Control". Science. 318 (5855): 1387–1388. doi:10.1126/science.1151148. PMC 2174918. PMID 18048670. ^ "Common Core State Standards Initiative Standards-Setting Criteria" (PDF). corestandards.org. Archived (PDF) from the original on September 16, 2012. ^ Chikatla, S; Rebecca Reese (2007). "Cognitive Flexibility Theory". University of South Alabama. Archived from the original on July 15, 2012. Retrieved November 18, 2012. ^ Duffy, Thomas M.; Spiro, Rand (1992). "5". In David Jonassen (ed.). Constructivism and the Technology of Instruction: A Conversation (1st ed.). Routledge. pp. 57–75. ISBN 978-0805812725. ^ Stephens, Elizabeth Campbell (1995). The design, development, and evaluation of Literacy education: application and practice (LEAP): an interactive hypermedia program for English/language arts teacher education (Ph.D. thesis). Houston, TX: University of Houston. OCLC 32965213. ^ Colzato, L S; van Leeuwen, P; van den Wildenberg, W; Hommel, B (2010). "DOOM'd to switch: superior cognitive flexibility in players of first person shooter games". Frontiers in Psychology. 1. doi:10.3389/fpsyg.2010.00008. PMID 21833191. See also: "Shooter video games improve mental flexibility". news.leiden.edu. Leiden University. April 29, 2010. Archived from the original on June 4, 2010. ^ Klimova, Blanka (September 2017). "Online brain training programs for healthy older individuals". In Frasson, Claude; Kostopoulos, George (eds.). Brain function assessment in learning: first international conference, BFAL 2017, Patras, Greece, September 24–25, 2017: proceedings. Lecture Notes in Computer Science. 10512. Cham: Springer-Verlag. pp. 48–56. doi:10.1007/978-3-319-67615-9_4. ISBN 9783319676142. OCLC 1003854463. ^ Tetlow, Amber M.; Edwards, Jerri D. (December 2017). "Systematic literature review and meta-analysis of commercially available computerized cognitive training among older adults". Journal of Cognitive Enhancement. 1 (4): 559–575. doi:10.1007/s41465-017-0051-2. ^ García-Betances, Rebeca Isabel; Cabrera-Umpiérrez, María Fernanda; Arredondo, María T. (January 2018). "Computerized neurocognitive interventions in the context of the brain training controversy". Reviews in the Neurosciences. 29 (1): 55–69. doi:10.1515/revneuro-2017-0031. PMID 28822228. This page was last edited on 20 February 2019, at 14:42 (UTC).